The constitution will also be amended to prevent other EU countries from transferring asylum seekers to Hungary. Nationalist Prime Minister Viktor Orban is defying EU policy on migration. Hungary, Poland, the Czech Republic and Slovakia oppose an EU scheme for relocating 160,000 refugees from Syria and Eritrea to EU partners of Italy and Greece, where migrant camps are overcrowded. The BBC's Nick Thorpe in Budapest says Hungary's parliament is debating the draft laws despite the fact that very few migrants or refugees try to enter Hungary now, due to a double-thickness razor-wire fence on the southern border. Mr Orban's right-wing Fidesz party has a two-thirds majority in parliament; the vote on the new laws is expected to happen next week. Mr Orban was re-elected last month for a third term. The legislation is called a "Stop Soros Act", reflecting the government's antipathy towards billionaire philanthropist George Soros, whom it accuses of encouraging Muslim immigration to Europe. Mr Soros, who was born in Hungary, dismissed that accusation on Tuesday, in a speech at the European Council on Foreign Relations think-tank in Paris. He said Mr Orban was challenging the EU's core values. Hungary's Magyar Hirlap daily says prison sentences, ranging from a few days to a year, are envisaged for people who smuggle migrants in, help them to get asylum or who fund illegal immigration. 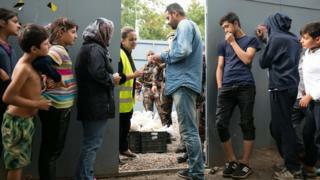 In 2015 Hungary was on the transit route for an estimated one million asylum seekers - many of them fleeing the wars in Syria, Iraq and Afghanistan. Most headed on to Germany, but the erection of border fences in the Balkans in 2016 reduced the influx drastically.